Voted #1 Most Innovative Company by Fast Company, Buzzfeed is a modern publishing phenomenon. If you’ve cast your eyes on a screen recently, chances are you’ve stumbled across a viral Buzzfeed video, taken a Buzzfeed quiz or read a Buzzfeed list that popped up on your feed. Their explosive presence is envied by the media world. But how do they seemingly create shareable content so effortlessly? Founded in 2006, Buzzfeed first started as a “viral lab” but now describes itself as a media company that provides the world with “the most shareable breaking news, original reporting, entertainment and video”. 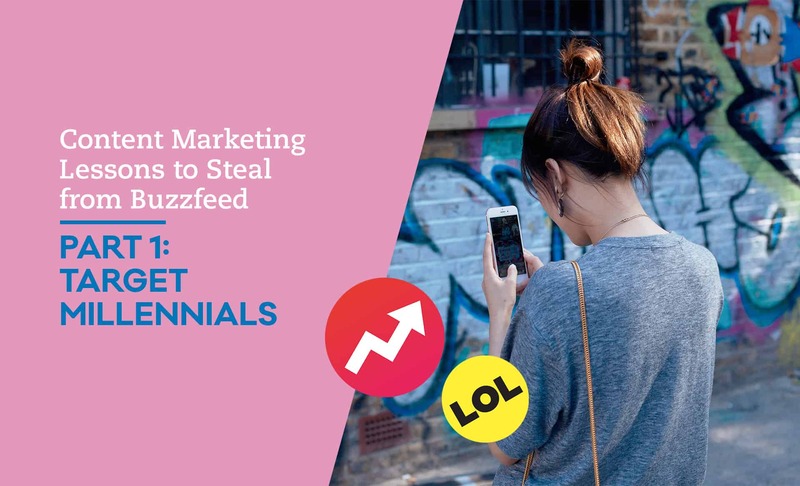 In this series of articles, we will identify key content marketing lessons that you can steal from Buzzfeed and adopt them into your own content strategy today. We hear the term “Millennial” pop up in marketing a lot. They are a highly coveted sector of the market by why? Who are they? What are their defining characteristics? What makes them so special? A Millennial can be defined in 2016 as a person between the ages of 18 to 34. They are digital natives, the first generation that has grown up online and now spend countless hours on social media. This is essentially how they stay connected to friends and how they consume information. Baby Boomers have been the largest segment of consumers up until now however Millennials are now replacing Baby Boomers in the workforce. By 2025 they will make up 75% of the workforce thereby being the primary consumers. Millennials differ from past generations because having grown up on the internet means that traditional forms of advertising that had worked on Baby Boomers (Gen Xers eventually grew into the same mold) don’t effect Millennials. Millennials tend to put off purchasing big-ticket items such as houses and new cars, they are less invested luxury brands and more likely to return to brands that they trust. They align with brands with the same values and brands that have made them feel like they have invested time in getting to know them. Millennials don’t like to be talked at, they liked to be spoken to. They like to be engaged. Buzzfeed boasts more than 200 million unique mostly visitors with a growing young audience. 50% of their viewership come from Millennials. Brands from American Express to Rogaine have partnered with Buzzfeed in order to reach the elusive market because Buzzfeed understands how to appeal to their values in a way that delicately balances casual humour without looking low quality. In the next instalment we uncover the importance to being true to your brand’s values.